Centuries before the development of e›ective cannons, huge artillery pieces were demolishing castle walls with projectiles the weight of an upright piano. The trebuchet, invented in China between the fifth and third centuries B.C.E., reached the Mediterranean by the sixth century C.E. It displaced other forms of artillery and held its own until well after the coming of gunpowder. The trebuchet was instrumental in the rapid expansion of both the Islamic and the Mongol empires. It also played a part in the transmission of the Black Death, the epidemic of plague that swept Eurasia and North Africa during the 14th century. Along the way it seems to have influenced both the development of clockwork and theoretical analyses of motion. The trebuchet succeeded the catapult, which in turn was a mechanization of the bow [see “Ancient Catapults,” by Werner Soedel and Vernard Foley; SCIENTIFIC AMERICAN, March 1979]. 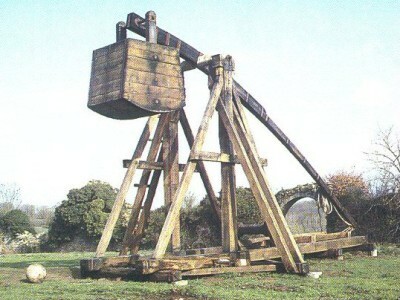 Catapults drew their energy from the elastic deformation of twisted ropes or sinews, whereas trebuchets relied on gravity or direct human power, which proved vastly more effective. This entry was posted in Uncategorized and tagged 14C, Africa, Black Death, Islamic, Mongol Conquests, Mongolia, Muslim, Plague, Technology, Trebuchet. Bookmark the permalink.